He took Xrays and a Kidney & liver enzyme check....he said they were perfect. His reflexes were very slow in in foot and he was concerned about nerve damage. GS's hip, leg & foot are okay...I guess just a sprain. 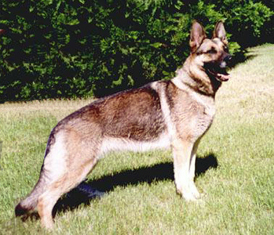 Emergency Room Vet said he has the best hips of any German shepherd he has seen for his age (7 yrs). Just a tad of arthritis. GS is now walking fine and I can move his leg all around without any complaints. Any ideas why he continues to hold his leg in the air when he is laying down? He seemed to be feeling really good now he seems to be lethargic.